Tammy Spice is known for her stylish bracelets...With unique color stories and materials wear alone or layer them all for a gorgeous arm party...YOU will LOVE them ALL... Made with love in the USA of Agate, Jasper, Sky Quartz, Crystal Quartz, Turquoise, Jade, Mother of Pearl, Austrian Crystals, Austrian Pearls, Czech Glass, Sterling Silver or 14K filled gold. They are 7'' expandable. Locket open to hold 2 photos. Hand designed by Tammy. Tammy Spice is known for her stylish bracelets...With unique color stories and materials wear alone or layer them all for a gorgeous arm party...YOU will LOVE them ALL... Made with love in the USA of Druzy, Agate, Jasper, Sky Quartz, Crystal Quartz, Turquoise, Jade, Mother of Pearl, Austrian Crystals, Austrian Pearls, Czech Glass, Sterling Silver or 14K filled gold. They are 7'' expandable. Hand designed by Tammy. 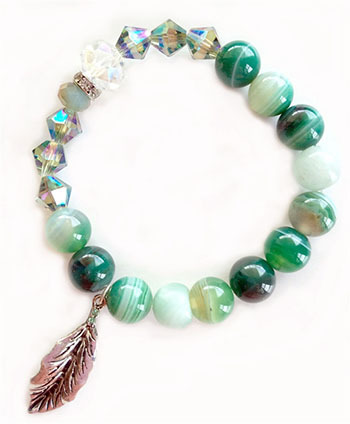 Made with love in the USA of Austrian Crystals, Semi-Precious Stones, Silk, 14-K Filled Gold. Coins are engravable. Hand designed by Tammy. Made with love in the USA of Austrian Crystals, Semi-Precious stones, 14-K Filled Gold. Hand designed by Tammy.